If you can watch this video and not end up charmed and dancing happily in your seat, I pity you. Filmed on an old VHS-loaded camcorder in Cape Verde, set in an indeterminate decade, at what appears to be an afternoon cocktail party, the camera follows (changing hands and perspectives!) everyone from children to the waitstaff to the cooks taking smoke breaks and people on the dance floor. 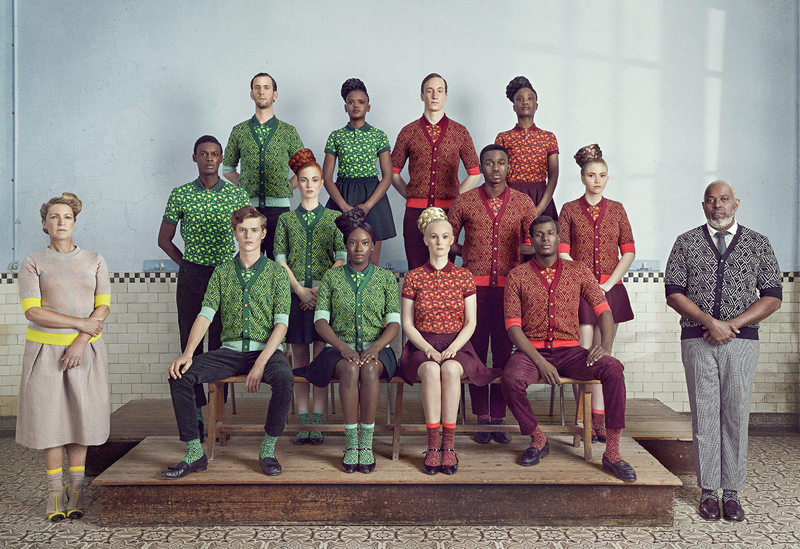 Everyone except for Stromae himself. It is a wonderfully conceived and smartly executed concept for a music video, and it leaves me beaming every time I watch it. The quirkiness cannot be overstated. I only lament that the line is not available in the states, and that the socks (adorable!) are €17. There was a time a few years ago when I had one of these Paranoid Parrot memes taped to my monitor at work: “Make one tiny mistake at work, assume I’m getting fired.” It sort of became my “thing” in the office, how paranoid I was about getting fired; I interpreted any conversation that occurred behind closed doors or in hushed tones as one of my impending dismissal. Thankfully, I got past it (likely when my boss held my job for me while I took a two month hiatus in Paris), until this past Tuesday, when I couldn’t immediately log into our company SharePoint site. 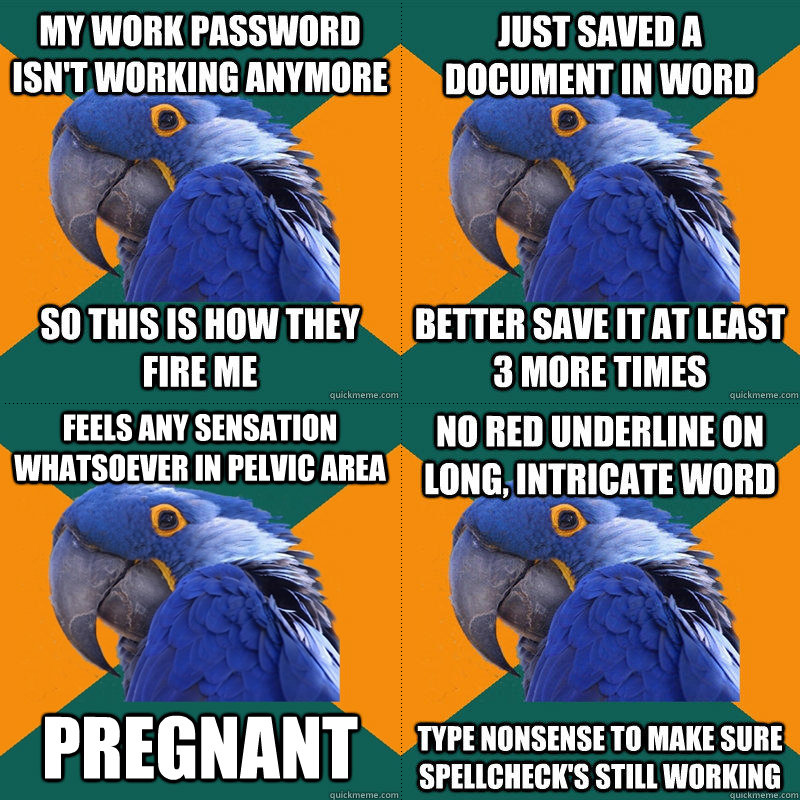 I’d sloppily mistyped my password, but for a brief moment, I had a full-on Paranoid Parrot melt down. SO THIS IS HOW THEY FIRE ME. Some of them are hilariously accurate! SNL has been so hit or miss the past few years (dare I say decades? ), and hit its peak for me during the Andy Samberg era. I haven’t even watched the show for a few years, mostly because staying awake until 11:30 (even on a Saturday!) is outside the scope of my abilities, but I happily caught last week’s episode and, in particular, this sketch. It seems like an obvious “Shawshank Redemption” spoof, until you get to the reason he’s in jail. “One man.” Seriously, try not to laugh. I bought an eyelash curler on sale at Sephora, and ladies, I am hooked. I’m not exactly a “makeup girl”; yes, I wear mascara and blush, but I can’t blend eyeshadow or figure out airbrush foundation, and in general, my makeup routine takes about three minutes. The idea of adding tools and gadgets to my makeup bag seemed foreign and unnecessary. And then one of my best friends got married and as we were getting ready that morning, her sister-in-law kept espousing the virtues of what, truthfully, looks like a modern day torture device. I’m supposed to put that thing near my eye? But damn if it doesn’t make a noticeable difference, especially in the morning, when I could use a little oomph to fight off the sleep still lingering in my face. oh my gosh, that paranoid parrot is hilarious. i definitely do the two on the right and used to do all of the above. it’s so funny how the things we do that seem “crazy” are actually pretty universal. Ha, right? One of them said, “Someone is following me around and writing down everything I do!” Universal is right. The pregnant one though is literally my life; my best friend is sick to death of getting texts from me that read along the same lines, haha. I’ll have to revisit this post when I have headphones and/or am at home to watch the videos, but I wanted to say that I love Stromae! Also, the paranoid parrot made me laugh out loud. Do you wear mascara after curling your eyelashes? I tried curling mine a couple of times but they completely uncurl after I put on mascara I felt like. Yay Stromae! Who doesn’t love him? All of his videos are so wonderful and quirky, but this one really won me over. thank you for sharing those stromae things with me – i haven’t seen them! just shared the music video with steven, it’s brilliant! also, i am not adult enough to use an eyelash curler. yet. maybe i’m doing it wrong? I love that paranoid parrot! Can definitely relate, which is kinda scary.